❧ Oh, how I miss California. So, my mom and I have been talking a lot about going to visit our family in California lately. She's about to get paid for a magazine article she recently wrote and it's supposed to be enough to cover plane fares for her, me and Rebecka. Plus some spending money. Anyway, we were just there last July because my grandparents (my mom's parents) hadn't met Rebecka (my daughter) yet and it was the perfect opportunity to go. Actually, it was kind of on a whim. I randomly pulled up various airline sites and checked out fares and that kind of gave us the motivation to make it happen. That trip was just so much fun and I'm really hoping that we're able to go back soon. 1. Obviously that's the Beverly Hills sign. I felt incredibly out of place driving through there because the houses were enormous. I could have passed by a few celebrities' houses and never would have known. It's such a beautiful place though, very kept-up. 2. The famous Katsuya restaurant. I wanted to go inside so bad, I was even going to use the 'Oh, I have to use the restroom' bit but decided against it. They might not have let me do that anyway. 3. 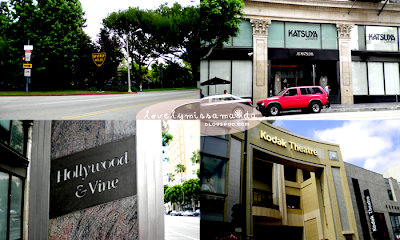 Hollywood & Vine, one of the most famous streets in the country. Since we were in Hollywood during the day, there wasn't a whole lot of action. It was a tourist trap for the most part but it was relatively exciting. I'm hoping to go back in the evening when everyone is out and about. 4. Kodak Theatre. If you've never read up on this place or have never been inside, you'd never know it was actually a mall. There are tons of stores in there. The theatre itself was closed to the public the day we were there, but I did manage to see inside. I saw the stage and everything and was just in awe. I'm big on meeting celebrities (although I've only met a few) so it was really cool knowing that celebrities had stood on that exact stage during award shows. I can't wait to go back. We were only there for four days last time and I'm hoping that we're able to stay longer so we can do more next time. For a kid originally from California, I sure haven't explored it enough.